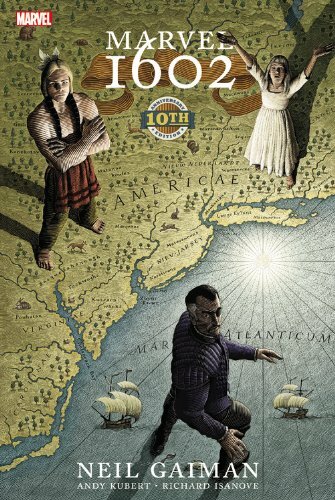 ANDY’S PICK :: MARVEL 1602 10th Anniversary Hardcover: So what if the Marvel Universe began 359 years earlier than the publication of Fantastic Four #1? This is a hardcover edition of an 8 issue mini-series written by Neil Gaiman with art by Andy Kubert and covers by Scott McKowen that was originally published in 2003. This series was so popular it spawned a number of follow-up series. The Virgin Queen sits on the throne of England; an empire that is about to experience a number of meta-human and magical occurrences. You’ll see many of the A-Team Marvel players get an Elizabethan make-over. But what about Captain America? You’ll just have to read it to find out. If you missed it the first time, you owe it to yourself to take a trip back in time and enjoy this well crafted tale.